Wing span: 2 3/4 - 4 inches (7 - 10.2 cm). 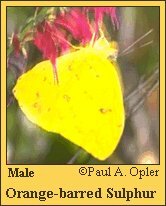 Identification: Upperside of male bright yellow-orange; forewing has red-orange bar and hindwing has red-orange outer margin. The two forms of the female, one off-white and the other yellow-orange, are much larger than the male. Both have upperside of forewing with solid black cell spot and a submarginal row of broken, angled black smudges. Outer half of hindwing of yellow form is red-orange. Life history: Swift, high fliers. Females lay single eggs on leaves and flowers of host plants; caterpillars prefer to feed on the flowers. Development is continous in the wet season. Flight: Two-three flights in Florida, one in northern range from mid-late summer. Adult food: Nectar from many different flowers. Habitat: Open lowland sites such as gardens, forest edges, parks, road edges. Range: Resident from Brazil north to peninsular Florida and the Keys. Irregular wanderer to south Texas; extremely rare vagrant in Colorado, Minnesota, Wisconsin, and Connecticut.